This is the making experience of your lifetime !! Our extra special, one-off, once in a lifetime course for 2014 is being held in partnership with Knoydart Forest Trust. Based for four days in a truly remote part of Scotland - The Knoydart Peninsula. Working in the most beautiful part of Scotland, this is an amazing opportunity to experience all the elements of resources and making in the wilds. This adventure into making will suit the hardy folks amongst you ! If you know the West Coast of Scotland you will know what we're talking about. However if you have never been to Knoydart well this is your chance to really feel the special nature of the place. The weather will be great in October, the midges will be gone by then, the scenery will be stunning, sunsets will be unforgettable and the trees will be looking great. The costs are all inclusive of boat fare, accommodation, breakfasts, lunches, tuition, materials, tool use and great company. We leave you the option of finding an evening meal, eating together in the bunkhouse or cooking it yourself. You will have to bring some food in with you and cash for the occasional beer at night ! The Course cost (£620.00) has been set at a rate that ensures that the People and Place of Knoydart achieves the most centre gain from our teaching time, your stay and personal local contribution. We have limited this special workshop to six participants so as you get the best of tuition time and visiting experience. The Big Tree Society is an award winning and only "Platinum" course provider of 2,000 courses in Britain. Our courses come with a guarantee of learning, landscapes and laughs ! Have a look through past images of events on the Big Tree Society Website. It will hopefully give you a feel for what you will be doing and what past furniture making folks have said about us and what they got out of their days with us! meet up with your fellow participants, course leaders and Knoydart Forest Trust hard-core. get to know the area a wee bit, get your accommodation sorted - chill ! Day Five - leave with your fantastic furniture ... and memories !!! Day One Learn about the timber, techniques and traditions of green woodworking form people that work with the natural resource everyday. Starting with a log in the morning you will work you way through to a beautifully made three legged Highland "creepie" stool. You will be using very few power tools, instead you'll design, fashion and construct using methods in a traditional style. This is laid back making which allows for the techniques to be absorbed and embodied in the final piece of furniture. Day Two and Three After a great evening wandering about, getting the craic with the KFT crew, and suitably fed and watered - you'll be raring to go !!! Having learnt so much the day before and confidence running high there will be no stopping you now. 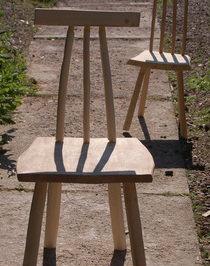 So the task for the next two days will be to hone your skills and make a piece of vernacular Scottish furniture in the Hedge Chair tradition. Once again, working with side axes, froes, augers, draw knives and spoke shaves, your eye will be well in by now and your hands working the timber with accuracy and ease. Trust me ! Day Four Well you've made two great pieces of furniture by now, starting to get the feel of the place. For those that want to do more making - you can ! Either further skills in greenwood working, or get the chance to work with the KFT guys helping in the timber yard or making their own product ranges or getting out on the land to see what great efforts they are doing in reforestation and woodland management. This is a unique project steered by unique people ! Day Five Reluctantly catch the boat back to Mallaig - leaving nothing but wood shavings and footprints ! Try and get over to Knoydart on the Monday Mallaig is 5 hours from Edinburgh, similar from Glasgow (by car) There is a regular train to Mallaig pier. If you are not up for sharing there are other accommodation providers on Knoydart , see the Visit Knoydart website for their details. We'll get a warm welcome at the Knoydart Pottery & Tearoom for breakfast and they will provide us with a good working lunch. Run by dynamic duo Rhona and Isla, the tearoom is a great meeting place. They'll keep you right ! - their baking is legendary !!!!! And the view from their window is worth going in for a coffee alone ! BOOK YOUR BIG MAKING ADVENTURE HERE - NOW !! Great new website with loads of up to date info about activities, events, other places to stay, eat etc. Have a good look round this site to get a feel for what you will be visiting. Please give The Big Tree Society a call or drop us an email.